The lights went off for thousands of people late this afternoon when a vehicle crashed into BC Hydro infrastructure. According to the Vancouver Police, the incident occurred just before 5 p.m. when a car travelling eastbound on the Georgia Viaduct lost control. The vehicle rolled over and caused extensive damage to nearby power lines. The single car collision caused significant traffic disruptions on the Georgia Viaduct. Emergency crews attended to one man, who was the driver and only occupant of the vehicle. In addition, more than 2,000 B.C. 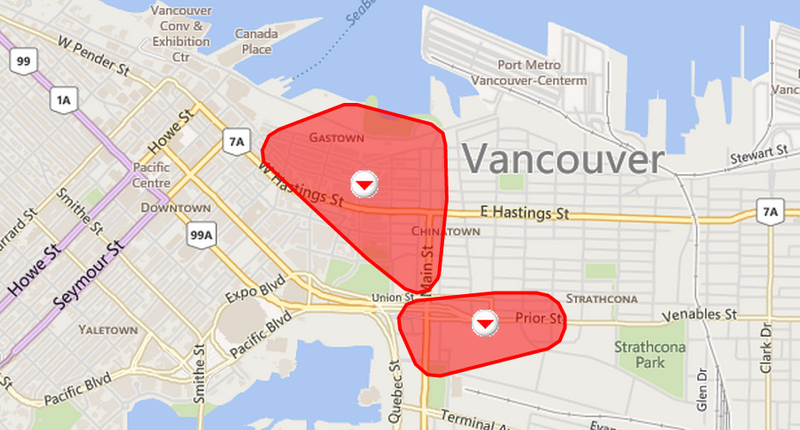 Hydro customers within the vicinity of Chinatown, Gastown and the Downtown Eastside were without electricity at the peak of the outage. As of 7:30 p.m., about 1,000 customers are still without power. UPDATE at 7:54 p.m. – Power has been restored to nearly all customers. Currently, 138 customers are affected.